The Orange Order has condemned those responsible for an attack on one of its properties near Dungannon. Republican graffiti was daubed on the door of an Orange hall on the Mullnagore Road. Damage was also caused to down spouts and security lighting at the rural building. It is believed those responsible also attempted to gain access to the property. The damage was discovered on Tuesday, but the attack may have actually taken place at the weekend. A Grand Lodge spokesman said the Orange community locally was “both disgusted and dismayed at this sinister act”. He added: “Such criminality is clearly an attempt to increase tensions, but we would urge people not to retaliate in any way. 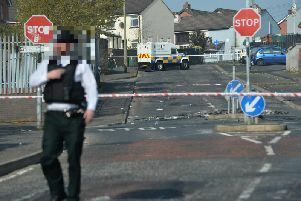 This incident was reported within 24 hours of a separate attack on Garryduff Independent Orange hall earlier this week. The spokesman urged anyone with any information to contact the police as a matter of urgency.